Goose wings swished in the darkness. Moccasins crept along the earthen byway. At the oaks, the rolling hill took a sharp drop, falling to the edge of the swamp grasses with a steep slope. Moccasins slipped and scooted. Halfway down the west face, four red oaks, all about the size of a rum keg, clumped together. Msko-waagosh sat in the gap that faced north, his wife lurked in the one to the south. The three trails that wandered across the swamp south of the watering hole converged at the tip of a cedar-tree-covered point that jutted westerly. That trail curved south along the mucky, sedge grass edge, some twenty-five paces distant, then angled uphill fifty paces to the south. The well-used trail and its feeders were all upwind of the four red oaks. Night’s black abyss ebbed to a dull gray. The cool, crisp air smelled damp and foretold of snow on that November morning in 1796. 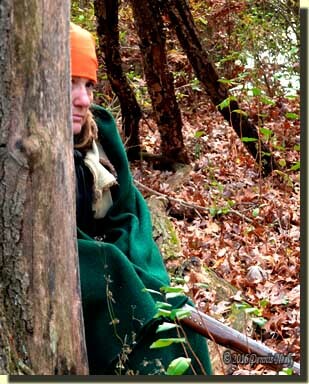 Both backcountry hunters wore trade blankets, draped loose, not tight. A doe and two yearlings meandered along the far side of the big swamp. The three wove in and out of red cedar trees that lined the bank. The last yearling kept looking back to the north side of the watering hole. In time, the trio melted into the forest. Geese ke-honked over the oak clump, winging hard to the west with desires on the River Raisin flats. Unseen crows cawed in the distance. Two chipping sparrows flitted from branch to branch on autumn olive bushes dotted with yellowish-green leaves. A red squirrel ran along the middle branch in the forked white oak to the south. The little critter took a mighty leap into a bushy cedar tree’s crown, scampered down the trunk some, then chased to the next cedar. In time the squirrel disappeared. Two gray squirrels materialized midway up the white oak. Silver-gray fur and bushy tails spiraled about that tree. The scratching of tiny claws sounded more like a young bear marking a territorial tree. A solitary crow passed over in silence. Leaves rustled as the two squirrels took their frolicking to the forest floor. Adding to the commotion, another gray leaped from a red oak, tumbled once, took two bounds, then stopped. This squirrel chattered away, then went about digging in the leaves. Dirt flew…a bound…more dirt…two hops…dirt…then a lone acorn. Watching for white-tailed deer seemed irrelevant. The forest jesters stole that 18th-century morning’s attention. In time, the fracas transitioned to three gray squirrels sprawled on different branches in different trees. Crows flew over, as did geese. Blue jays swooped here and there. The one closest to the four-tree fortress uttered a contented, “Swip-it! Swip-it!” A crimson cardinal perched on a purple switch in the raspberry patch on the point; “Whit, whit, tsu, tsu, tsu, tsu, tsu,” was his song. Back in January, I had the opportunity to have lunch with some good friends who share a common desire to preserve our muzzleloading heritage. This was a work session dedicated to focusing on ways to promote the black powder shooting sports here in Michigan. The discussions were frank, creative and insightful. But as always at such gatherings, good-natured kidding and a constant back-and-forth banter hyphenated serious conversations. “It’s a necessity of life to a trade gun shooter. We call that green stuff ‘wadding,’” I said with a straight face. Green roughage isn’t the preferred natural wadding material of choice, at least not for Msko-waagosh. Black powder is “hygroscopic,” which means the granules attract moisture from the air. If green leaves are used to wad a smoothbore’s load, the black powder starts extracting moisture from the leafy mass, and in a matter of hours, the load becomes “damped.” Damp black powder does not burn well. Dry wadding material is available all year. Yes, it may take a bit of careful searching. Woodland experience helps in locating leaves and grasses with a low moisture content, but it is my contention that returned captives like John Tanner, Jonathan Alder and James Smith knew what to look for and where. That morning, two Novembers ago, both “Old Turkey Feathers” and the “Silver Cross” harbored death spheres wadded with dry oak leaves: two rolled in a ball over the powder charge and one rolled leaf over the ball. Depending on weather conditions and humidity, I might keep the same load in Old Turkey Feathers for more than a day. Range testing and wilderness classroom experience have proven the dry leaves will not dampen the load. When the time comes to change the load, the usual practice is to take aim on an old box elder tree on the east boundary of the North-Forty and discharge the load. 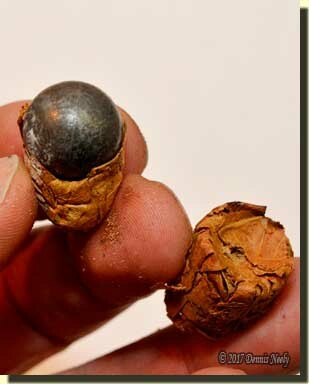 This process confirms the flint is sharp, the touch hole is open and the powder still dry. A hang fire, klatch or weak-sounding “Kla-whoosh-BOOM!” sends chills up the returned captive’s spine and indicates a human error that needs attention. Here again, I try to accomplish either task with only a gun worm, which is what I believe Tanner possessed. Shot loads pull easy. The gun worm spirals into the wad and pulls it as a solid component. The same worm can dislodge packed shot, then pulls the wad over the powder charge. Removing a round ball tamped firm over a wad is more difficult. Getting the worm to grip the ball is the problem. Once it moves, it usually comes free. Every once in a while, a wad or wads will pull intact, showing no sign of being disturbed. When that happens, the over-the-ball wad shows a concave depression where it fit over the death sphere. Likewise, the over-the-powder wad shows the same indentation. In essence, the lead round ball is encased in a primitive shot cup of sorts. The only variable present is where the ball sits on the wad in relation to the center of the bore. Studying how the ball rests within the wad column and observing the thickness of material around the ball, tends to indicate that the ball is centered or almost centered in the bore. I have not pulled any wads that show the ball off to one side. This goes a long way toward boosting confidence when using natural wadding materials. At the range, the same holds true when using green grass for wadding. When pulling a load to see how well it is seated, the freshness of the material allows the wad to expand, and as a result the concave cup “fluffs up,” but the depression is visible, nonetheless. 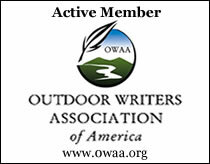 This entry was posted in Deer Hunts, Research, Wilderness Classroom and tagged Black powder hunting, Dennis Neely, historical trekking, Mountain Man, National Muzzle Loading Rifle Association, Native captive, North West trade gun, Northwest trade gun, trade gun, traditional black powder, traditional black powder hunting, traditional blackpowder, traditional blackpowder hunting, Traditional Woodsman. Bookmark the permalink.